The Triceratops Trail in Golden takes visitors on a 1.5-mile round-trip hike to see tracks from dinosaurs and other animals and impressions and traces from plants in what was a swampy sub-tropical delta during the Cretaceous period about 68 million years ago. The dinosaur tracks include a Triceratops and a Diplodocus and possibly a Tyrannosaurus rex and an Edmontosaurus. The tracks are reversed and stick out where the dinosaurs stepped into the mud. The gravel trail winds between tall walls of sandstone and into reclaimed clay pits. Allow an hour. 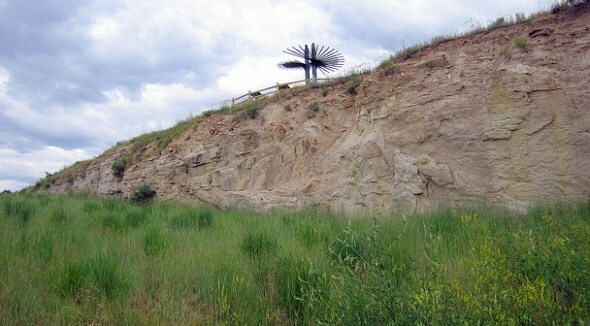 The trail sits next to the Fossil Trace Golf Course and used to be the site of the Parfet family’s clay mine, which produced bricks for Denver. The tracks were discovered during golf course construction in 1987. The trail is part of the Morrison-Golden Fossil Areas Natural National Landmark, which also includes the Dinosaur Ridge near Morrison. Both are operated by the nonprofit Friends of Dinosaur Ridge.